I was flipping through the channels on Dish Network, and found to my surprise that there were apparently some new channels. One, called The Science Channel, I decided to take a peep at. It was late at night, and I see this dude, pimped out in a turtleneck and coat, and featuring a classic late 70s haircut, to say nothing of those remarkable eye-brows. I was fascinated. His voice, vocabulary, and delivery – they entranced me. Then, here he is, talking about “Comet Halley” and the like, when he starts leveling all of these unsolicited moral judgments. I was taken aback, and thought about crazy little science videos they used to make us watch in elementary school. So here he is, talking innocuously about the history of man’s knowledge of the planet Venus. Throughout the show, he seemed to revel, not in the facts, but in past and future errors – he took a kind of delight, gave a kind of wry smile each time he was able to indulge a little prickishness into the learning. I love how he anachronistically mocks ancient science. 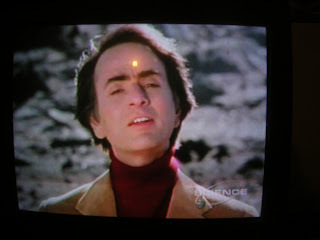 I found out only later that this is Carl Sagan. He’s a gem. Excerpted from kittenry‘s flickr page.